Bill West runs Blue Iris Fish Farm, a 40 acre facility containing nine culture ponds and 12 culture pond-side tanks. Blue Iris is located approximately 12 miles north of Appleton, WI. 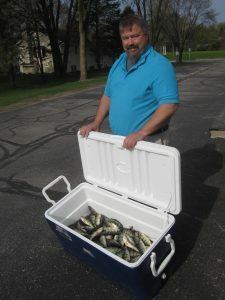 Blue Iris specializes in the culture of perch and bluegill mostly for the fish food market. Blue Iris conducts research to enhance culture production and grow-out. A SARE grant (FNC08-731) and Wisconsin ADD grants 21014 and 24023 completed work on elimination of digenetic tremetode infestations of perch and bluegill and completed an in-depth assessment of creating a fish cooperative. Blue Iris participated in a federal feed study (least cost diet studies conducted by North Central Regional Aquaculture Center [NCRAC] in 2012). Blue Iris also participated in a study with Milwaukee School of Freshwater Sciences in comparing grow-out of perch using a fish vs non-fish meal diet. Blue Iris currently works with local high schools in providing fish, feeds, and research ideas for local agriculture programs. Jerry Peplinski runs Peplinski Aquaculture, a 30 acre, multi-pond facility located immediately northeast of Cecil, WI (approximately 20 miles west of Green Bay). This operation specializes in the production of bluegill and perch for the food market. In addition to the ponds, Jerry has experimented in the use of pond-side tanks for perch and bluegill culture and also participated in federal feed studies (least cost diet studies conducted by North Central Regional Aquaculture Center [NCRAC] in 2012). Jerry is currently completing work on a SARE grant (FNC14-955b) which investigated manufacture of fish hydrolysate and conducted preliminary protein assessments of hydrolysate. Jerry has been raising fish for over 20 years. Mike and Kathy Foster run Wilderness Springs Inc, The Trout Farm, LLC in New London, WI. The facility encompasses about 10 acres and includes about 30 ponds and 12 concrete raceways. The ponds are fed by eight artesian wells and can be augmented with pumped well water. The main fish raised in this facility is trout which have been raised there since 1974. Most of the trout are raised for pond stocking and fee fishing. In addition to the farmers, three high schools will be participating. Teachers participating include: Tom Sebaneck of Green Bay Southwest, Kaleb Santy of Pulaski, and Scott Stomberg of Shawano High School. These teachers teach ag and biological sciences and are in charge of the aquaculture/greenhouse resources of their respective schools. Finally, Dr. Bob Smith of Clayton Veterinary Service provides a guest vet demonstration at each of the schools each year of the project. Project was initiated upon award of grant in March 2016. 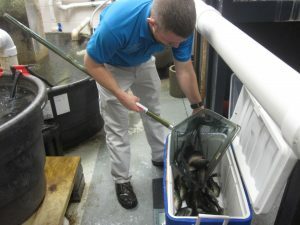 The representative fish farms (Blue Iris Fish Farm, Wilderness Springs, and Pepco Aquaculture) prepared fish stocks which would be used in three local high schools (Green Bay South West, Shawano, and Pulaski). None of the high schools have the same capabilities; facilities ranged from small aquaria to full sized recirculating aquaculture systems (RAS), aquaponics systems and greenhouse applications. In addition, we also encountered systems suitable for wide ranges in temperature tolerance including cold (rainbow trout), cool water (perch, bluegill), and warm water (tilapia and fathead minnows). Each of the schools is quite a bit different. We would have liked to put in the same amount of fish at each school but their systems dictate otherwise. However, we were able to get between 300 and 800 in each school and these are multiple species. We targeted 500 perch per school, 200 bluegill, 200 trout, and 100 fathead minnows. We also had one school receive tilapia. All schools also received the fish fertilizer (hydrolysate). The classes are all different but the students are in charge of tank cleaning, feeding, weighing and measuring, calculating feed rates, and determining harvest dates. By September of each year, all of these fish were moved from the fish farms to schools. Fish stocking capacities at each school were based on available resources and the ability of the in-school growing systems to accommodate stocking densities. Stocking densities were kept low as the first year was intended to be a year of testing out system capabilities. Stocking densities were increased the second year and one school (Pulaski) installed outside pond-side tanks so as to be able to use the onsite pond for summer culture. Toward the end of the first semester of 2016 Dr. Robert Smith, a fish veterinarian, visited with each school and presented a lecture on fish health followed by a necropsy of some of the fish that each school was raising. Fish health assessment can identify problems in fish disease, water quality, feeds, and overall system conditions. The vet visit was repeated in the fall of 2017. The highlight is that one school began harvesting its first crop of perch by the end of December 2016. These fish were stocked in the school in September at an average of four inches. About 25 percent were between 8 and 9 inches at harvest. Another 50% were on the table by the end of January just in time for lent. We believe that there is some overfeeding occurring in each school. This results in deterioration in water quality which is easily correctable. It is also believed that there may be, for the most part, too much aeration. This is due to the tendency to provide lots of air to make sure there is enough. The result is wasted air (difficult to throttle the blower) but more importantly, over aeration tends to beat up the fish waste and it is more difficult to remove dissolved waste versus solid waste in the filtration system. In addition to too much air, we have witnessed occasional power outages and have lost some fish because of power outages at each school. A simple backup system which is independent of power was installed as noted above. Fish losses were significantly reduced in the second year. The grant proposal predicted that there might be higher losses in the first year and that is why stocking densities were lower in the first year i.e., it takes time to get comfortable with processes and work out bugs that are inherent in the various systems. One of the results that we had hoped for was that we could generate a keen interest from the students in learning more about aquaculture, open our farms to summer help to those who might be career oriented, and increase an appreciation for these biological and water related sciences. We were pleasantly surprised to have students ask us how to set up small home systems. As noted above, fish were starting to be harvested by all schools by January 2017. Some fish were retained until May 2017. Fish once harvested were processed and sold and schools could calculate the value of the product. Depending on how successful each school is in accomplishing the grow-out phase of aquaculture will determine how much money can be reinvested into the program. When comparing individual schools, we see differences in growth rates. The rates of growth were based on water temperature, oxygen concentrations, amount of feed, and efficiency of waste treatment equipment. These are some of the variables that need to be controlled to optimize production. Even so, in 2016, we were able to harvest several hundred perch. A typical return is between 15 – 17 pounds of fillets per 100 fish. Current market of perch is a minimum of $13 per pound. That money is available for the school to sink back into the aquaculture program. In 2017, the number of perch delivered to the schools was around 1500 perch and several hundred trout. With no mortalities, we anticipate a substantial increase in marketable fish. The perch alone have a gate value of about $2900 less processing fees. 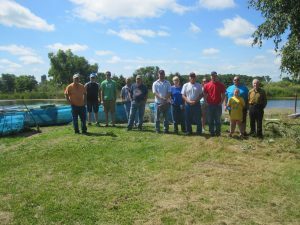 An open house event occurred at Blue Iris Fish Farm. Over 60 visitors came to observe the fish operations. Blue Iris provided a tour of the facilities and pointed out the methods of culture and actual species that would be used in the school program. When the vet provided the presentation, there were six different classes that were available for instruction within the three schools. It is estimated that approximately 120 students attended these presentations. We intend to also showcase our project with open houses at each school in 2017. Bill West of Blue Iris also gave a presentation discussing the project at the annual Wisconsin Aquaculture Association Conference in March 2017. Problem Local school districts and in particular aquaculture (agriculture) are under- funded. Aquaculture and related sciences are relatively new curriculum choices. Only the newest of facilities have somewhat adequate resources while older schools’ ag resources have been converted to house aquaculture. Many of these have a wide assortment of tanks, plumbing and equipment that have been for the most part patched together to carry out instruction. These systems generally suffice to accommodate only the most stress tolerant fish. It is difficult to teach biology, chemistry, and water science in these situations but even more difficult to actually have a three to six month project that works. The problem we hope to solve here is to use the resources of the three farms to support the schools with fish, feed, technology, and guest lecturing. The SARE grant will get each school up to a level of operation which will be supported by the fish farms. Value provided by the schools will be re-invested to carry on the curriculum in subsequent years. The second problem we have which is common to most states of the North Central SARE Region is that fish farmers have a very short growing season. The farms need additional growing season which can be provided to some extent by the schools. The idea here is to develop and infuse into the schools goals for projects and production which then become the learning tools of the class. Professional support provided by the farmers is designed to result in successful aquaculture programs which mimic real world enterprises. Working in cooperation with school systems could allow fish farms to start the season a little earlier and end a little later i.e. extend the growing season by as much as one to two months. Blue Iris Fish Farm and Pepco Aquaculture have been conducting research on perch and bluegill for a number of years. Some funded research (SARE FNC08-731, SARE FNC14-955, Wisconsin ADD 21014 and ADD 24023, NCRAC least cost diet for bluegill) and unfunded research on fish meal and non-fish meal based diet studies with Milwaukee Fresh Water Institute suggests that there are numerous projects that can be conducted by small farms for the benefit of the industry. These small efforts are well suited to be conducted in a school setting where we have resources and a controlled environment. The issue is to ensure that the schools have the needed resources to conduct mini research projects in a controlled environment. What this project proposes is to have three long-term farm experts assist in setting up learning situations and provide continuous support to the partner schools. Second, we will identify each facility’s resources so that needed equipment/technology is provided to each school and, the curriculum matches the resources. Because we have three species of fish (trout, perch and bluegill) plus several other species to choose from (catfish, tilapia, walleye [saugeye]), we essentially have multiple opportunities. By incorporating on-farm projects into the school with farmer technology support we will encourage successful aquaculture projects. Successful school projects will result in more value-added outcomes e.g. more saleable fish, more aquaponics production, better results for facilities that use fish hydrolysate for plant sales. These are all opportunities to have a positive interface with the public and increase the possibility for developing a self-funding program. These endeavors help the farmers with the execution of mini projects that need to be done in a controlled system that extends longer than three months, can extend the growing season in the fall or can actually initiate the growing season in the spring. For the two years of the project Blue iris hosted an open house at the farm. The purpose of the open house was to talk about the grant, hand out materials related to the project as well as SARE handouts, and show participants the actual fish and production methods used to prepare the fish for use in the school aquaculture programs. To broaden the outreach, Blue Iris gave presentations at both the annual Wisconsin Aquaculture Conference and the Wisconsin Ag Teachers Annual Conference. Going into the project, we as fish farmers knew that each school had different teacher experience, different equipment, and different capabilities. We also knew that there was a good chance that the fish would not survive the experience. Therefore, before delivering any fish to school, we conducted a site visit at each school to interview the teacher(s), inventory school resources, and identify what species of fish the school was capable of raising successfully. This was time well spent. While we could circumvent many problems before they surfaced, some issues would always persist. It is essential to specifically detail procedures for fish care including feeding schedules, maintaining water temperature, and maintaining wastewater treatment/water quality (#1). Finally, it does not matter how many backup air supplies you have, when the power goes off, one of them has to work. The farmers participating in this project were determined to provide the schools good fish. If you ask the teachers what they received from other providers in the past, it was generally what was left in the fall. With this project we gave the schools the best we had. The reason is that the project had to be something that approximated real life. We expected that with our assistance, fish would survive and be a real learning experience. No one gains when a nine-month project is terminated in the first month. All the teachers appreciated the quality of the fish, their growth rates, and the value of the final product. The second success was to have a fish vet give a two hour per school talk and fish necropsy each year. The health of the fish is directly affected by feed, water quality, densities, etc. 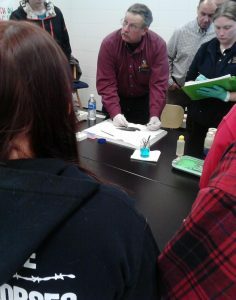 For most students (and teachers) this was the first time they ever looked into the health of fish. Money and time well spent. In the big picture, we as farmers and consumers are trying to get the school systems to teach real world applications. Most schools that have aquaculture may also dabble in aquaponics. One of the things we tried to do was to use fish species that are local and have high market value – trout and perch. 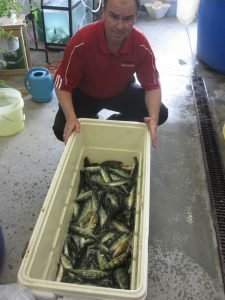 While trout is more difficult with aquaponics, perch certainly are a good candidate. One thing we did learn is that most aquaponic systems do not optimize for fish. With this project we reverse the trend by focusing on fish over plants. More needs to be done here. Second, we learned early on that air (oxygen) supply is not guaranteed. Therefore, we recommended that each school install a solenoid and air supply line with diffusers. The solenoid is purchased as a “normally open” valve. One would rent an oxygen cylinder, install proper gauges, then go through the solenoid, then through a valve manifold (one valve, line and diffuser for each tank). The solenoid is plugged into a power supply and when plugged in, is closed. With loss of power, oxygen is supplied to each fish tank. A picture of the setup is provided earlier in this report.